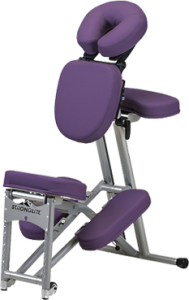 Can’t take time off work to complete your chair massage training? The Short & Sweet Chair Massage Course will be perfect for you! The course is specially-designed for people who would like to train in chair massage, but not have to take any time off work. The Short & Sweet Chair Massage Course will give you basic training in the type of chair massage you will perform at public events like festivals, farmer’s markets, trade shows, conferences, sporting events, working with seniors and in workplaces. There are no pre-requisites to be able to sign up for the Short & Sweet Chair Massage Course. This is a basic chair massage training program that will get you up and running, performing chair massage in public settings. This is homework you’ll do before you come to class. We have created a great introduction to anatomy and physiology as it applies to performing chair massage and we have a number of useful resources, showing what life will be like as a chair massage provider. This module will take about 15 to 20 hours to complete. This is when you come to class for Friday evening (7:00 – 9:00 pm) and all day Saturday and Sunday (9:00 am to 5:00 pm each day). You will be learning and performing chair massage with your fellow classmates. Class sizes are typically 8 to 12 students. Once you complete your classroom training, you will start the skills development phase of the course. We want you to practice what you learned in class and you’ll do this by completing 20 documented chair massages. Once you complete these 3 steps, you’ll receive your certificate of completion and you can get started massaging! We will provide you with the use of massage chairs during the classroom training. You’ll need to think about getting your own chair once you complete the course. You can either take care of this on your own, or if you would like our help, just let us know. BONUS: Once you’ve completed the Short & Sweet Chair Massage Course, if you decide you would like to further develop your chair massage skills and business development skills, we will allow you to apply the full tuition you paid for the Short & Sweet Chair Massage Course toward either our Chair Massage – Basic Package or Chair Massage – Gold Package. This offer will only be available for 6 months following the end of the classroom training. Are you ready to begin your new career in Chair Massage? Click the link below to sign-up. You will be able to select the location and dates that work best for you in the drop-down menu in the registration form. If you have any questions, feel free to call us at (604) 475-8665 or 1-800-792-0452 or email us at info@integracollege.org.